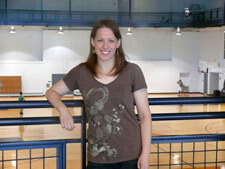 Lynn Herrmann is a graduate student in Kinesiology and Community Health. As a current doctoral student in Community Health, I was drawn to the KCH department because I was allowed and encouraged to take a variety of classes that suited my interests. My interests happen to combine both community health and kinesiology. I felt like I had many options and resources as I refined my research interests. I was honored to receive the Campus Teaching Excellence Award in 2010. At the awards ceremony and reception, I had an opportunity to meet and have conversations with people from departments all over campus who truly value teaching and learning. My dissertation is about gender and exercise. I am looking at how personal and social factors influence exercise choices among men and women. I am looking into a variety of academic positions in which I can teach and do research. I am also going to continue teaching group exercise classes and further expand my work as a continuing education provider/trainer for exercise professionals (e.g., fitness instructors and personal trainers). Anything that has to do with group exercise! I teach group exercise classes for Campus Recreation, including Zumba, Beamwork, PiYo, and MVe Pilates. I enjoy going to group exercise trainings and masterclasses. I also have fun with my dogs, 3 very active Shelties. KCH graduate studies offer a flexible program that can be tailored to students' specific interests.